Anyone who has had a screen on a sliding door is familiar with the problems associated with this type of screen. The flimsy metal frame bends easily and must be replaced when bent. The screen is stretched into the frame so the first time someone forgets it is there the fabric gets torn from the frame. It is usually just as expensive to get someone to come out and re-screen it as it is to replace the whole door. The rollers never seem to work well and easily come off the tracks making the screen useless. Even when the screen is not needed it is there, over the fixed glass panel of the sliding door unit, collecting dirt and blocking the view. Wouldn’t it be nice if there was a screen that worked well, was not prone to damage, and was out of sight when not needed? Now there is; with the introduction of retractable door screens a few years ago it is now possible to eliminate those ineffective and unsightly sliding door screens. A sliding door retractable screen is almost invisible when open, but when a screen is needed simply pull it into place. 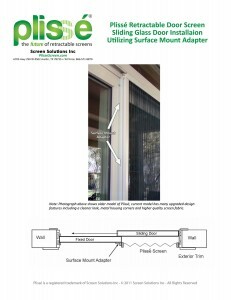 A new and innovative design in retractable screens, the Plissé (PLEE’-say), is available from Screen Solutions Inc. This unique design relies on pleated screen fabric which folds into its housing, unlike conventional retractable screens that use springs and bearings. The Plisse retractable screen design lowers the cost of the Plissé and makes it much more forgiving of the out-of-square and out-of-level openings typically found on sliding doors. No expensive professional installation is needed so you can save even more on the cost of installation. On both sliding doors and atrium style doors, one side of the Plissé is mounted on the surface of the fixed door panel using our unique surface mount adapter. Click here for more information on surface mount adapters. I need info about the Plisse retractable for a standard size sliding glass patio door. Is there local supplier I can contact. Thank you for contacting us regarding your screening needs. We don’t currently have any dealers in the Annapolis area though most of our customers purchase our Plisse retractable screens as a DIY product. In cases where our customers haven’t felt comfortable with that option they’ve found success using a local handyman for the job. Since our screens are custom cut to your (or your handyman’s) measurements they are pretty much ready to install and most handymen can get the job done in less than an hour. Lastly, if you really just want to see the product before investing in it we do offer a free 2′ x 2′ working sample. You can order one on our website, you’ll give a credit card for a $25 deposit that will be deleted as long as we receive the sample back in good condition in 30 days with the simple 5 question survey filled out. We pay for UPS ground shipping both ways as well. I hope this helps but please don’t hesitate to contact us if you have any other questions.